There are three major types of 3D printers, two of which you can go out today and buy for several hundred or thousand bucks. The third variety, known as selective laser sintering (SLS) printers, has resisted the rapid drop in price in recent years and continues to retail for hundreds of thousands of dollars. That is due in part to the complexity of the parts that go into the machines, but also due to patents covering SLS technology. Fused deposition modeling (FDM) and stereolithography (SLA) printers didn’t drop in price until key patents expired, and it was thought that once SLS patents began to drop away this year the same pattern would emerge. 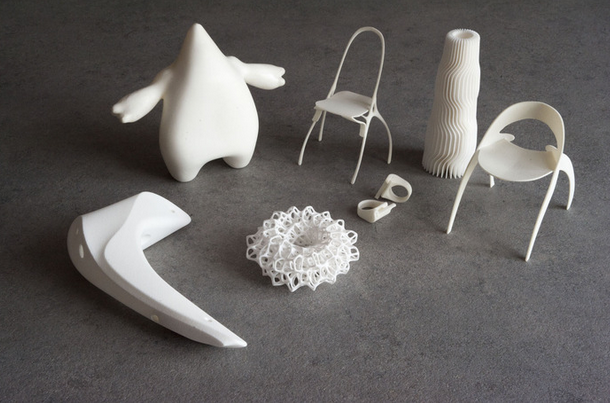 Objects printed on a Norge SLS 3D printer. Photo courtesy of Norge. But there has been no sudden wave of cheap SLS printer options because, as I noted in April, SLS is an inherently messy and dangerous technology. It uses a high-powered layer to seal powder together into a solid object, which means it’s just not as suited to the desktop environment as SLA and FDM printers. Several projects are in the works to hack laser cutters into SLS machines and take other cheaper approaches, but they require expertise with machines. But all of a sudden, there are two relatively inexpensive options for SLS 3D printers. First, there is a machine by Italian 3D printer maker Sharebot, which also makes FDM printers. The company has finished developing an SLS printer that will cost less than $27,000, 3Discover.it reports. If that price tag still seems a little high, check out the two printers by new startup Norge. The company is currently crowdfunding a desktop-sized machine for $8,300. It is also available on the Norge site for $12,500, plus a larger version for $33,000. 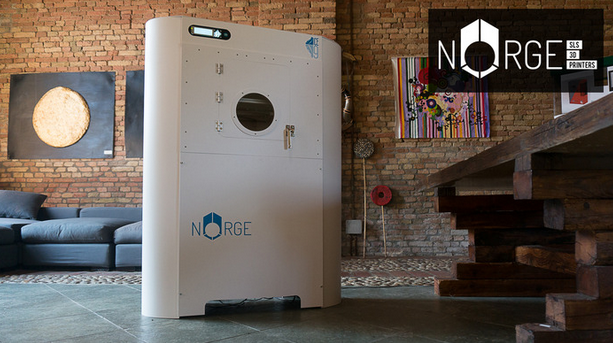 The Norge 3D printer. Photo courtesy of Norge. Dropping $8,300 for a 3D printer, let alone $30,000, might sound insane, but it’s a steep drop from the $1 million machines that companies tend to invest in when they need an SLS printer. The lower prices are within what smaller companies that need to make frequent prototypes currently pay for upscale SLA and FDM machines. This may be the beginning of SLS following in the footsteps of the two cheaper technologies, spurring the creation of even less expensive options. It’s unlikely that SLS machines will soon be available for the sub-$500 price that has become so common with desktop 3D printers due to the higher cost of the parts involved, but it is looking more likely that it will at least be an option for small businesses.